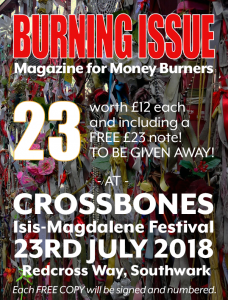 The Crossbones Vigils have been held at 7pm on the 23rd of every month since 23rd June 2004. 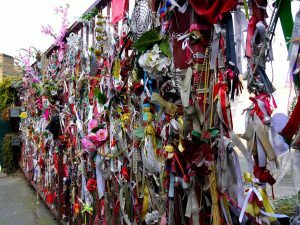 They were originally conceived to remember the outcast dead buried in the Crossbones Graveyard, to renew the shrine to the outcast dead and to reclaim the secret history as revealed by The Goose to John Crow. 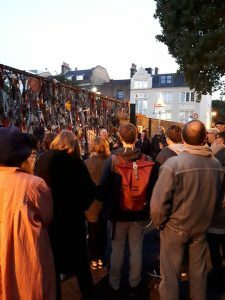 Over the years we’ve also begun to remember our own lost loved ones, many of whom have stood with us at Crossbones Gates. 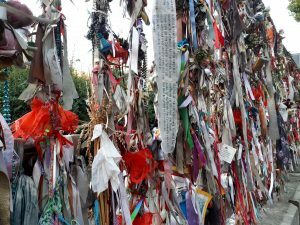 We always say that each Vigil is unique, depending on the energy of the night and what people bring to it, though each is held by the simple ritual forms we’ve followed and evolved on the 23rd of every month since 23rd June 2004. In terms of remembering our own dead, the 23rd September Vigil for the Outcast our most challenging yet most rewarding Vigil ever. I brought my mourning to the gates – individually remembering Caras E Esta, Lindsay Kemp, Will Hensel, Martin Barker, Di Sherlock’s brother Mike (all of whom died in the last month), Ken Campbell (who died 10 years ago last 31st August), John Joyce (whose ashes are scattered at Crossbones), Irving Rappaport (who died on 23rd September 2017, exactly one year before this Vigil), and last but definitely not least, George Isherwood. And in all this we were held by the five simple rituals with which for more than 14 years we’ve held the space here in the streets at the Crossbones Gates, allowing us to receive and work with whatever strangeness the night may bring us. And this is why we return again and again to the sacred place of the outcast. 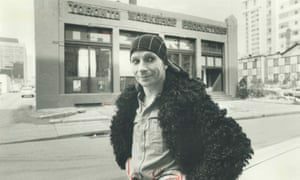 Lindsay Kemp taught David Bowie and Kate Bush all they ever knew – at least according to Lindsay! He certainly taught them, and all of us who were drawn into his charmed world, to be ourselves, only more fully, to be free and fearless and, above all, to be ‘FABULOUS!’ I got to know him in 1973, when two of my best friends joined the Kemp Company. He was 35, I was 21 and in awe of him, though he never patronised my clumsy boyish enthusiasm. FLOWERS, his adaptation of Jean Genet’s ‘Our Lady of the Flowers’, was mind-blowing, beautiful, terrifying, sad and funny all in one. I must have seen it a hundred times – at The Bush, The Regent, and many more theatres here and abroad. I loved his other work – Mr Punch’s Pantomime, Salome, Midsummer Night’s Dream, Duende, Parades Gone By, Cruel Garden – but Flowers was the one which influenced my own life and work more than any other. In the ’70s I trained with him and became a camp follower. I’ll never forget when he got us all invited to a party in a country estate at Virginia Water, his outrageous tribe of queens and heads cavorting in a house that had once belonged to the Duke of Windsor. He was out as a gay man long before it was cool – or even safe – to be so, and inspired and mentored so many others, including my dear friends Atilio Lopez and Neil Caplan, both of whom died in the early ’80s during that terrible first wave of AIDS. Around that time, when I was touring Europe with Sheer Madness and other theatre companies, we’d run into the Kemp Company in Brussels, in Berlin, in Barcelona. In the late 80s/early 90s, after his shows at Sadler’s Wells, I’d go back stage and be reminded how, years before, Lindsay’s dressing room had seemed to me not only the most magical place on Earth, but also the one place I always felt truly safe – no matter what mental state I was in. When I visited him in Rome, his feet were giving him trouble and he could hardly walk – yet he kept going, and astonishing us all, for many more years! Love and gratitude. Viva, Lindsay! Dance on, forever! Open pathways. George had been ill for some time and suffered much near the end, so his death wasn’t entirely unexpected, and in some ways is a deliverance, yet his absence from this world of fools is keenly felt. George was an extraordinary theatre creator, an actor-writer-director who inspired and encouraged so many of us. He combined a deep love of Shakespearean theatre with an equal delight in tacky American cartoons. The two came together in his masterpiece ‘Shakespeare’s Greatest Hits’, a tragi-comic retelling of 4 Shakespeare tragedies performed in under 75 minutes, using all the high and low arts of street theatre, with toilet-plungers for swords and industrial quantities of stage blood-capsules – and all this long before Reduced Shakespeare Company came up with a pale imitation. The photo shows the final act of Anthony and Cleopatra with George as Anthony and me milking the bit part of a dying Egyptian slave. ‘Hits’ was devised with Minnie Marx and the Sheer Madness group they founded – with us all contributing something (my dying Hamlet came up with the immortal line: ‘Not to be. That is the answer!’) – but George’s eccentric genius and guiding spirit was writ large all over that prize-winning street show. 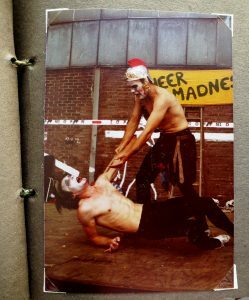 I joined Sheer Madness in 1980 – we started out passing the hat in the streets of London, then were a big hit at the Amsterdam Fools Festival and spent the rest of that year touring Europe in a Mercedes van. Sheer Madness totally lived up to its name – none of us had a permanent base, we stayed in hotels or crashed with supporters, friends, fans. In Germany we scaled the dizzy heights – playing in big Stadt Theaters and winning the 1980 Konstantin Wecker Art Prize – and plumbed the lower depths – in Jahrmarkts, doing tacky clown shows between the snake woman and the psycho knife thrower, all to the stink of grilled bratwurst! I left the group at the end of a crazed year, though I later went back to do short tours and stayed close friends with George ever after. He went on to devise and direct many other great shows for Sheer Madness and as an independent writer/director. We’d meet once or twice a year – and always enjoyed recalling the best and worst of Madness times (including the infamous “Brussels clinch”! ;)) George had an encyclopaedic knowledge of history – from the ancient Greeks and Romans through to the 21st century – and enjoyed dissecting the vital contribution of US and UK foreign policy to making the mess the world is now in. 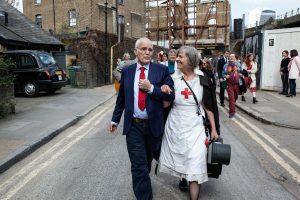 Over the past 20 years, Katy also became good friends with him, and we were touched that he came to our wedding last April, even though he’d been seriously ill not long before. During my year of playing Hamlet to George’s Claudius in ‘Shakespeare’s Greatest Hits), I used to regularly, literally, spit in his face – something he specifically directed me to do! Long after I stopped being Hamlet, he’d recall our stage rivalry with great affection, often addressing me as ‘Sweet Prince’. At the wedding reception, he once again offered his face, inviting me to have one last spit. And, with both of us already sensing that this might be the last time we met, I stroked it tenderly. And we laughed. That’s the last of so many beautiful, funny memories of George. Our thoughts are with him on Monday 24th, with his husband Richard, and with all who knew and loved him. Open pathways, dearest George. George, Irving, John, Ken, Mike, Martin, Will, Lindsay and Caras will all be remembered, along with many other friends on the ever-growing roll-call of the gone but not forgotten, at the 23rd October 2018 Vigil. 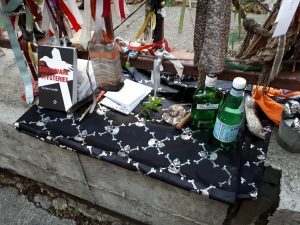 The October Vigil has taken on many of the attributes formerly associated with The Halloween of Crossbones, the ritual drama performed every year from 1998 to 2010 and revived from 2015 and 2016, in which we joyously commune with the spirits of the dead. Goose be with him, with them, with us. Open pathways! 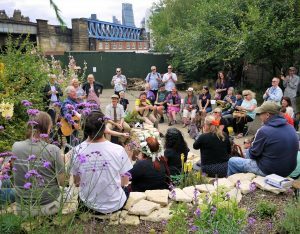 Please attend if you can, to listen and learn and to reaffirm that the identity and character of Crossbones Garden must be protected alongside any development of the larger Landmark Court site – as the place of the outcast, a wild garden in the heart of London. Becki can be contacted directly: RebeccaSelby@uandiplc.com There’s also an exhibition and general public consultations being held at the Africa Centre on Friday 6th: 12-8pm and Saturday 7th: 10am-3pm, in case you can’t make it tomorrow evening.